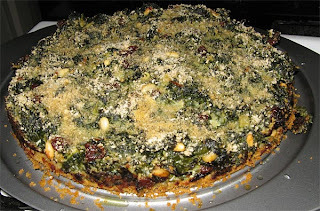 This is a Swiss chard torte with raisins, pine nuts, and parmigiano. Crust of breadcrumbs. Delicious! Another gem from Marcella Hazan's book, although vastly less common according to Google. Googling "tegliata di biete" brings up practically no results, so here's my contribution to the cyberkitchen. It turned out wonderful and went mostly to Marcella's plan. Tegliata di biete (Venetian origin). Adapted from Marcella Hazan's Essentials of Classic Italian Cooking. 1. If using mature chard, cut off the broad stalks and set aside [good sauteed with garlic and olive oil for a side dish!]. Cut the leaves into 1/4 inch shreds. Soak and wash the chard. 2. Boil water in a pot, using enough water and pot volume to accomodate the chard. Cook until tender, approx. 15 minutes. Drain and set aside to cool. 3. When cool enough to handle, squeeze the moisture from the chard. 4. Chop the chard very fine. 6. Choose a sautee pan that can accomodate the chard. Put in 1/4 cup olive oil and the chopped onion. Cook at medium until the onion turns a light nut-brown. 7. Add the chopped chard, turning heat to high. Cook, turning the chard over frequently, until it becomes difficult to keep the chard from sticking to the pan (if using non-stick, you'll have to eyeball it to sense when the chard has properly heated through and become coated with the oil/onion mixture). When done, transfer entire contents to a bowl and let cool. 8. When chard has cooled to room temperature, add the grated Parmesan, the beaten eggs, and the pine nuts. Drain the raisins, squeeze them dry in your hand, and add them to the bowl. Add a few grindings of pepper. Mix thoroughly, taste and correct for pepper and salt (the Parmesan is salty, so a small pinch of salt is probably all that's necessary). 9. Smear the bottom and sides of the springform pan with olive oil. Use a little more than half the bread crumbs, spreading a thin layer evenly over the pan. Add the chard mixture, leveling it off, but not pressing it hard. Top with the remaining bread crumbs, and drizzle the top with olive oil (higher quality, the better here). 10. Put pan in preheated oven, bake for 40 minutes. 11. Remove pan, running knife edge along side of pan to release the torte. After 5 minutes rest, use a spatula to loose the torte from the pan bottom and slide it, without turning it over, onto a serving plate. Serve at room temperature. Do not refrigerate. i made this last night with GREAT success - found baby chard at the market and used the stems and all . . . delicious. used a 7" pan - non-springform pan a parchment lining produced a higher torte - which i think is perfect. even better the next day (as usual). i agree - hazan's book is really fantastic. i've made this about 10 times now - it's fantastic. also good with kale or spinach - any leafy green. one hint - it's much easier if you cook the leaves whole and then chop once steamed and cooled. much less mess, and easier clean up. also, adding a good 1/2 cup cream just makes it that much richer and moist. i also add hot red pepper, ground white pepper, and if i'm in the mood, some freshly grated nutmeg . . .